are now organized into a global value chains that span countries and regions. These networks are not static and they are continuing to evolve. Networks will determine where things are produced, how they are created, and how they make their way to consumers. The dynamics of global networks is essential to understand how globalization is evolving and where it may be headed in the future. 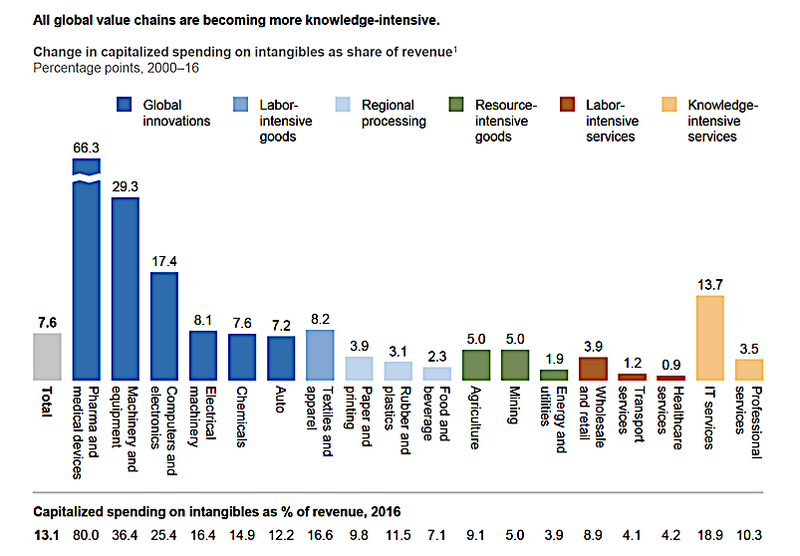 The prices that are ultimately realized by global consumers reflect whether the goods and services are knowledge intensive of labor intensive. Those who are global innovators are found to be all knowledge based. Pharmaceuticals, machinery and computers will spend a large share of revenue on the acquisition of knowledge. For instance, pharmaceuticals and medical devices spend up to 80% of total spending on innovation whereas agriculture and mining will spend only 5%. The largest exports from developing countries to underdeveloped are for machinery, computers, electronics and chemicals. Food and beverage exports that constitute a large part of US trade are relatively insignificant in the balance because they tend to be commodities. 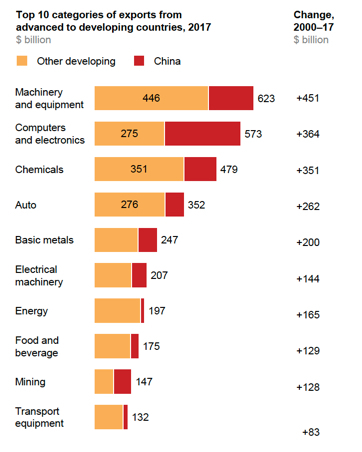 Dominating is the China huge volume of imports for computers and electronics and machinery. These trends indicate that developed countries are concentrating on the building of a higher value economy. Those are different patterns that applied to colonial relationships between developed and underdeveloped economies. In colonial times exports would concentrate on energy, food, beverage, mining and transport whereas the new approach is to use imports as a way of advancing an economy to a more advanced stage. We take the differences between high value exports, e.g. computers, and low value exports, e.g. food as a sign that profound changes are now taking place. Developing countries are increasing the consumption capacity of their consumers while developed countries are shifting to an increasing profitability from a favorable balance of trade. Such a shift if best reflected in the exports to China that is in the process of building up a high-value consumption economy. 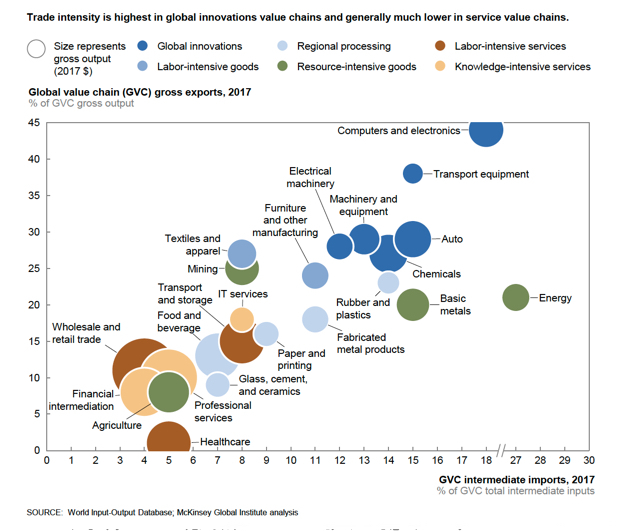 These trends are also reflected in the concentration of global trade on the innovation-based high value added export chains. Computers and electronics are placed high in such valuations whereas agriculture ranks low. When such a perspective is considered in trade negotiations between the US and China it becomes apparent that China's emphasis on importing electronics, such as microchips, is now traded in favor of larger US exports of agricultural products. The above chart can be useful in trade negotiations between developed and underdeveloped countries. The future of a global information economy is based on the acquisition and possession of high value and profitable technologies by developed countries while leaving the export of low value and commodity products to underdeveloped countries. Such rebalancing will favor high income countries that have a limited population to pass low income but high employment opportunities to emerging countries. Such rebalancing by means of international trade can be seen as a way how to shift consumption pattens for developing economies. The largest share in consumption is taking place as Chine shifts its share of trade from 2% in 1995 to 16% in 2030. Developing countries in Europe show only modest gains from 3% to 7% and developing countries in the Americas gain only from 7% to 9%. 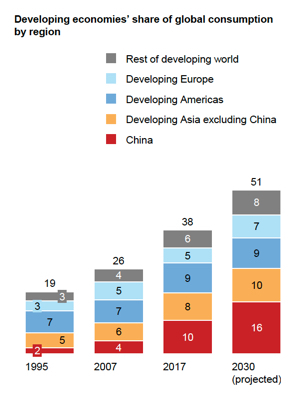 These reallocation of global consumption patterns confirm the rising dominance of China. They are achieving superior growth though a re-allocation of the components of international trade. International trade should not be seen primarily as bartering the differences between labor and capital costs. The balance of trade becomes a means for changing how goods and services are distributed on a global scale. The Chinese rising gains in consumption should serve as a clue that they are pursuing a policy for achieve a re-distribution of wealth that views trade as a political and economic tool for reordering the power relationships on an international scale.